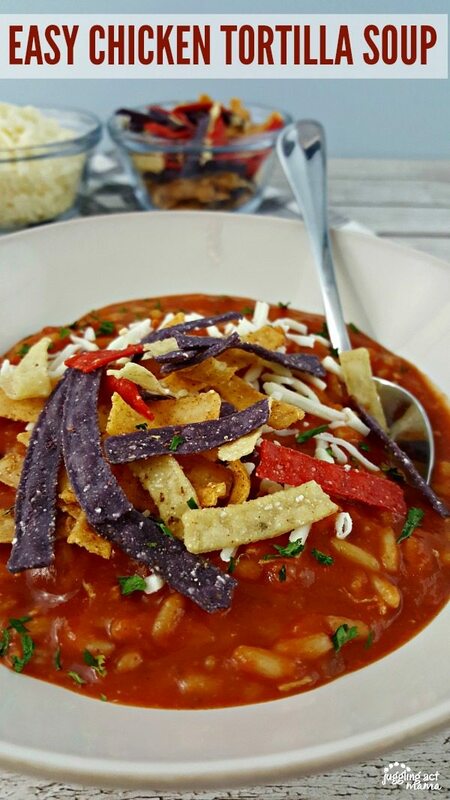 Our hearty Easy Chicken Tortilla Soup is warm and comforting during the cold winter months! 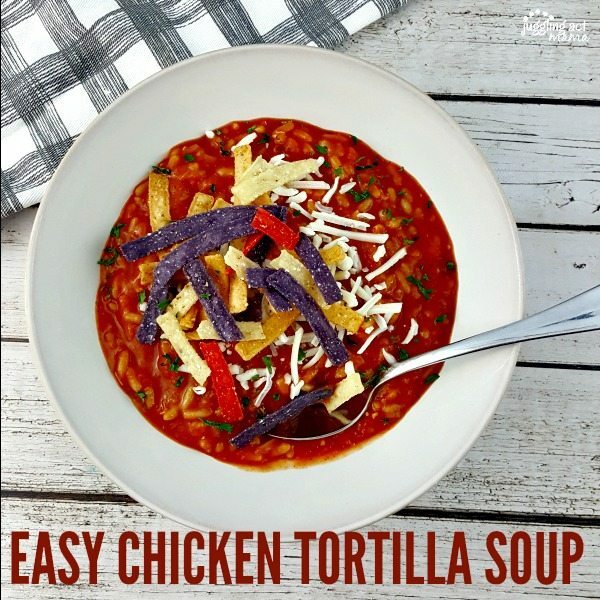 Easy Chicken Tortilla Soup will be your new favorite soup this winter. Serve it with your favorite toppings for a quick weeknight meal. This post contains affiliate links; we are a participant in the Amazon Services LLC Associates Program, an affiliate advertising program designed to provide a means for us to earn fees by linking to Amazon.com and affiliated sites. I only promote things that I love and think you will love, too! For more information, please see our Disclosure Policy. 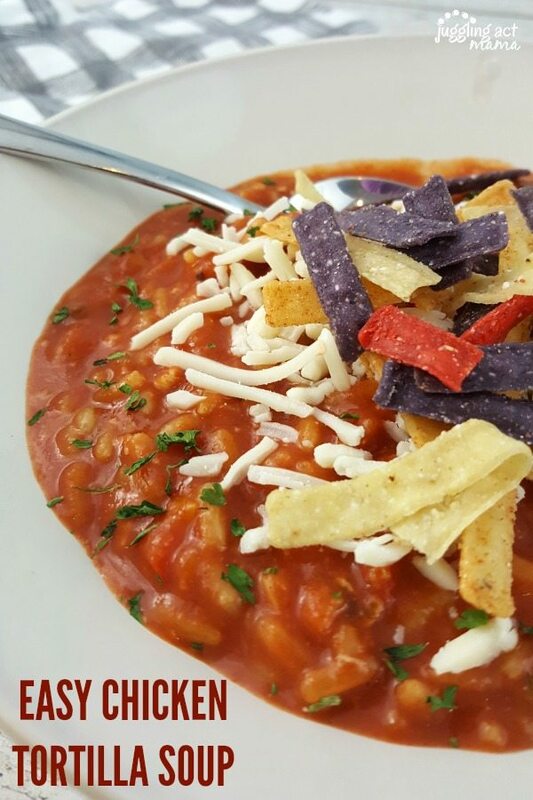 I have been craving the simple chicken tortilla soup that our local Mexican restaurant serves with queso fresco and tortilla strips. Recently, my mother-in-law and niece were visiting during a cold snap here in New Hampshire. I wasn’t sure if either of them were going to like this, and I think my mother-in-law was pretty skeptical. She is a no-nonsense kind of woman who likes easy recipes, and my niece – like my son – is a picky eater. One bite, and they were both hooked! My mother-in-law even asked for this recipe, and that’s how I know it’s a winner! 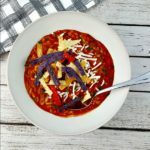 This Easy Chicken Tortilla Soup recipe really couldn’t be more simple! This soup starts with a can of tomato puree and a carton of chicken stock. I use low sodium products so that I can control the amount of salt in the recipe. Be sure to taste before serving and adjust your seasoning as needed. On Sundays, I try hard to prep to make the week ahead easier. For instance, I use onions almost daily, so mincing up a couple and putting them in a container means when I want to assemble my recipe, I just need to measure them out and keep moving. I use plastic food storage containers and label them. I often do the same thing with red, yellow and orange peppers as well. It’s a huge time saver! I use chicken breasts, but you can use any chicken you like event shredded rotisserie chicken. Instead of pre-cooking the chicken, I let it cook in the soup so it absorbs all those wonderful flavors from the cumin, oregano, and garlic. This Easy Chicken Tortilla Soup is made in just 30 minutes is perfect for a crowd. Everyone gets exactly what they like by adding delicious toppings to suit their own tastes. In a Dutch oven heat the olive oil over medium heat, then add the onion and peppers and cook until tender. Add the garlic and cook 1-2 minutes more. Add the chicken stock and tomato puree. Add the chicken to the pot. Season with taco seasoning mix, granulated garlic, cumin, salt and pepper. Bring the soup to a boil, then reduce heat and allow the soup to simmer for 20-25 minutes until the chicken is tender. Just before serving, stir in the prepared Spanish rice. Serve with optional toppings tortilla strips, sour cream, chunks of avocado, Queso Blanco, chopped cilantro and slices of jalapeno peppers. If using pre-cooked chicken, reduce the cook time to 15 minutes. Add a can of black beans and/or corn for an even heartier soup. 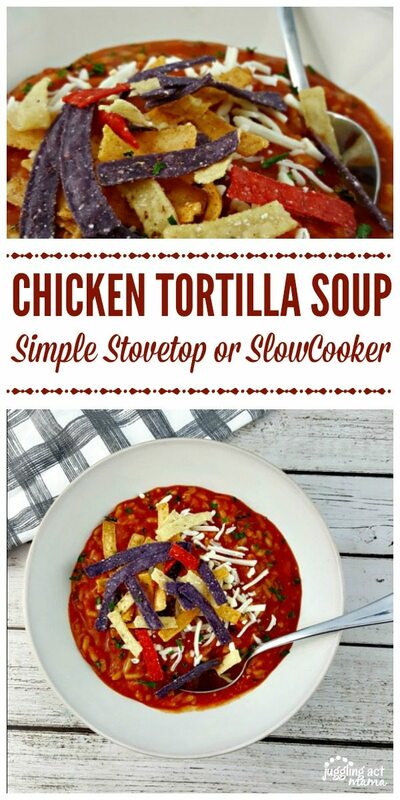 Tortilla Strips (I love using seasoned tri-color tortilla strips ). To avoid the rice from soaking up all the liquid, add it to each individual bowl when you are ready to serve, rather than the pot. 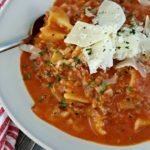 To make this even easier, use your slow cooker and it will be ready waiting for you when you come home! In a small skillet, cook the peppers and onions in olive oil under tender. Add the garlic and cook 1 minute more. Transfer the pepper mixture to the slow cooker. Add the tomato puree, chicken stock, seasonings and stir to combine. Add the chicken and set the slow cooker on low. 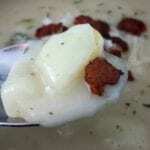 Cook the recipe and spoon into serving bowls just before serving. With warm spices, this chicken tortilla soup is perfect for cold winter nights. You can also double the recipe and freeze half of it (omitting the rice). 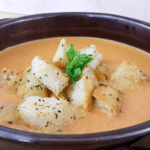 Place the soup into a freezer-safe container. I like using these freezer containers with lids that I mentioned earlier. This also makes a great recipe for meal trains and pot lucks. If you give this recipe a try, be sure post and tag me on Instagram @jugglingactmama! I love hearing from you, too, so I hope you’ll leave me a comment below. 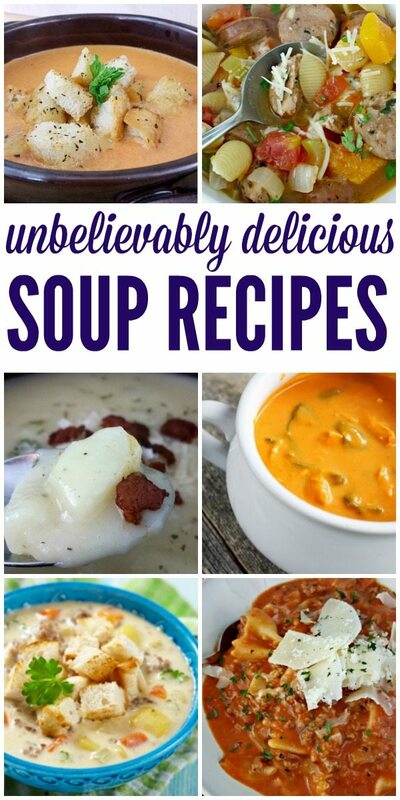 This soup is DELICIOUS!!! So good in fact, my picky 7 year old ate it up! The best part…was throwing it into the crock pot on Sunday morning and having a healthy and scrumptious meal waiting for us at the end of a busy day. I will definitely be trying other recipes too! I am so glad your family enjoyed it! I hope Troy feels better soon! !